Suffering jet-lag on top of all that, while going cross-continental is no fun. Qantas A330 is one of the few airplanes providing a lie-flat bed for its passengers in a 1-2-1 layout within business class, called Business Suites. 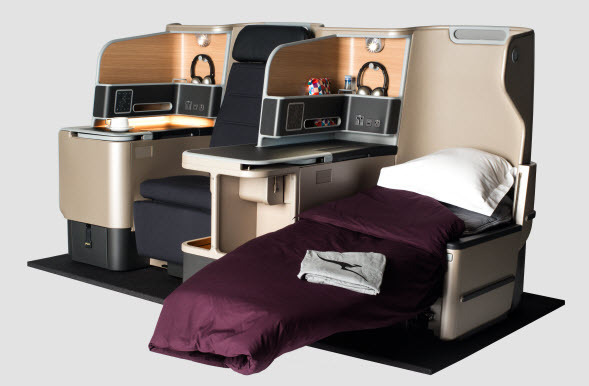 Qantas’ Business Suites provide plenty of legroom and lie-flat beds for well-rested travel. During take-off and landing, you’re allowed to stay fully reclined. There is a ‘Do Not Disturb’ function that you can activate, allowing you to snooze without interruptions after your satisfying meal. Good food on board is crucial in attaining satisfaction and deep slumber. To ensure this, Qantas has brought in Australian celebrity chef Neil Perry — who is also the airline’s creative director of food, beverage and service — to design its new Spring menu. Chicken and shiitake wonton soup with ginger and shallots.